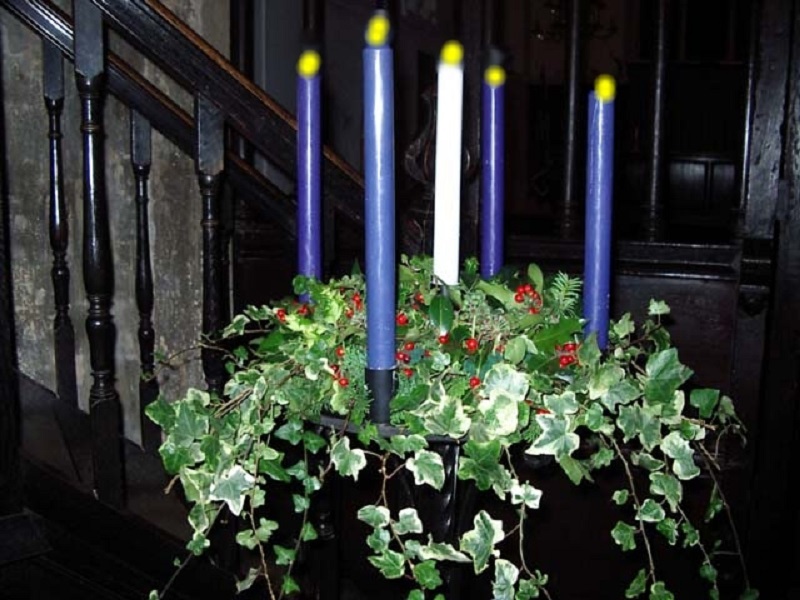 The origin of the Advent wreath is uncertain. It is believed that Advent wreaths have their origins in the folk traditions of northern Europe; where in the deep of winter, people lit candles on wheel-shaped bundles of evergreen. It is believed that pagan Mid-Winter rituals sometimes featured a wreath of evergreen with four candles. The candles were placed in each of the four directions to represent the elements of earth, wind, water and fire. Rites were solemnly performed in order to ensure the continuance of the circle of life symbolized by the evergreen wreath. Like many Church traditions, the use of candles in the late fall and winter was originally a pagan tradition. Rev. William Saunders wrote that “pre-Germanic peoples used wreaths with lit candles during the dark and cold December days as a sign of hope in the future warm and extended sunlight days of spring.” In the middle ages, the Germanic peoples began incorporating a lighted wreath into the Christian season of Advent. It didn’t gain widespread popularity until the 1800s, and it wasn’t until the 1900s, that German immigrants brought the tradition to America.There is evidence of pre-Christian Germanic peoples using wreathes with lit candles during the cold & dark December days as a sign of hope in the future warm & extended-sunlight days of Spring. In Scandinavia during Winter, lighted candles were placed around a wheel, & prayers were offered to the god of light to turn “the wheel of the earth” back toward the sun to lengthen the days & restore warmth. Both the evergreen & the circular shape symbolized ongoing life. The candlelight gave comfort at this darkest time of the year, as people looked forward to the longer days of spring. By the Middle Ages, the Christians adapted this tradition & used Advent wreathes as part of their spiritual preparation for Christmas. By 1600, both Catholics & Lutherans had more formal practices surrounding the Advent wreath. The wreath is made of various evergreens which are green yeear round. The Advent Wreath is endlessly symbolic. The evergreens in the wreath itself are a reminder of continuous life. The shaping of them into a circle reinforces that meaning. The circle is also a sign of the eternity of God.The circle of the wreath, which has no beginning or end, symbolizes the eternity of God, the immortality of the soul, & the everlasting life found in Christ. The four candles represent the four weeks of Advent. In some Christian churches, one purple or blue candle is lit each week, but the Catholic church uses a rose candle on the 3rd Sunday. Purple dyes were once so rare & costly that they were associated with royalty; the Roman Catholic Church has long used this color around Christmas & Easter to honor Jesus. The candles symbolize the prayer, penance, & preparatory sacrifices & goods works undertaken at this time. The light signifies Christ, the Light of the world. Some modern day wreaths include a white candle placed in the middle of the wreath, which represents Christ & is lit on Christmas Eve.